Since last October, German fast-food workers have been in a conflict with employers over fair pay and a living wage. In collective bargaining with the German food workers union NGG, the companies have offered a wage which is considerably below what the German government calculates as the minimum needed to build for a decent retirement. 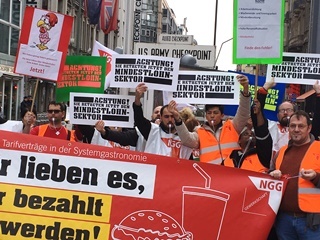 Since the start of this year, more than 1000 workers and supporters have participated in protest actions and warning strikes at McDonald's, Burger King, Starbucks, Pizza Hut and Autogrill. The employers have shown no serious willingness to negotiate a living wage. These workers deserve an income which doesn't consign them to poverty, now and in their retirement. Support German fast-food workers in their struggle for fair wages - use the form below to send a message to the employers who refuse to pay a living wage! The message is in German, followed by English.